The Botanist is the newest, sleekest eating and drinking establishment in the city centre, and it doesn’t get much more central by overlooking Grey’s Monument. I’d visited when it first opened for a press day with work, and gushed about how cool the interior looked. When their 50% January voucher appeared, I knew it had to be, and booked us a dinner date on a Tuesday night in January. We arrived just on time, and were immediately shown to our table. I love the décor. It’s very whimsical with a huge tree coming out from behind the bar area and the glass dome of Monument Mall being draped in fairy lights. The big hanging bulbs, and thick wood tables all added to the charm. We had to turn our waiter away a few times as it took us so long to decide what we wanted. In the end, we decided to get two starters to share (Cumberland and pork chipolatas with honey grain mustard and a homemade houmous board with crudités and flatbread), and I ordered sausage and mash for my main while MrJ ordered a hanging lamb kebab. 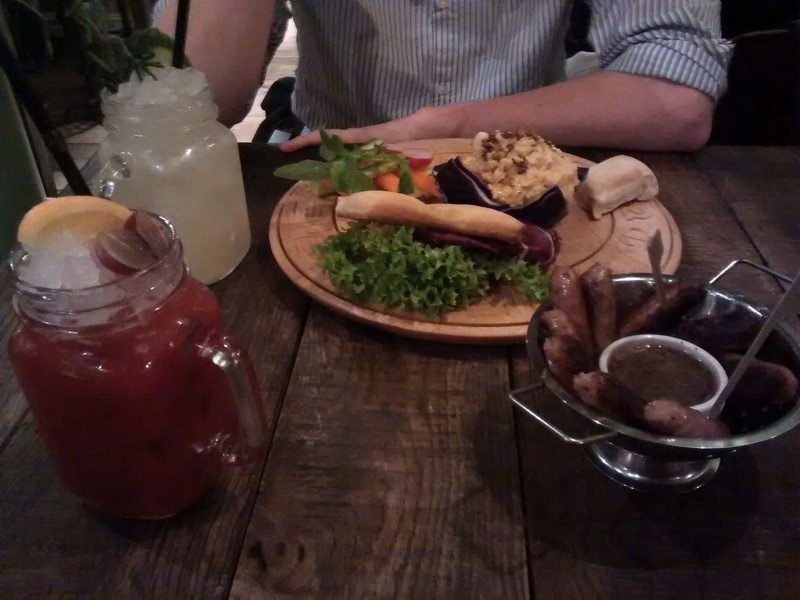 Only after our waiter had taken our orders and walked away did I realise that I had ordered a sausage starter to share, and also sausages for my main course. Oops! Never mind. The starters were lovely, presented prettily, and were big portions. I loved the houmous dish and how the houmous came in tightly-wrapped cabbage leaves. 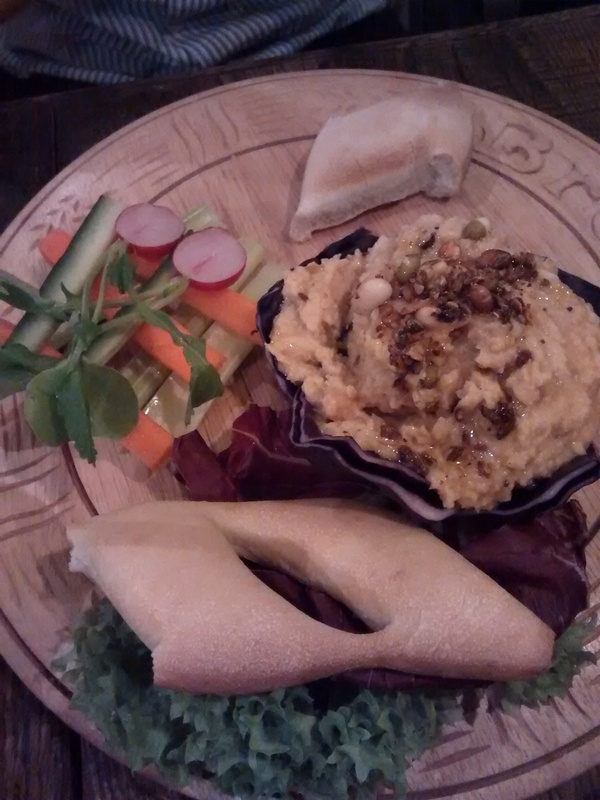 The houmous had a good flavour, and was a decent portion size (even after our endless dipping). The little chipolatas were also delicious coated in the honey mustard – both starters didn’t last long! While we waited for our mains to arrive, we sipped on a Cucumber and Rosemary Fizz and Grape, and Raspberry and Elderflower Cooler. Both lovely. It didn’t take too long for our mains to arrive. 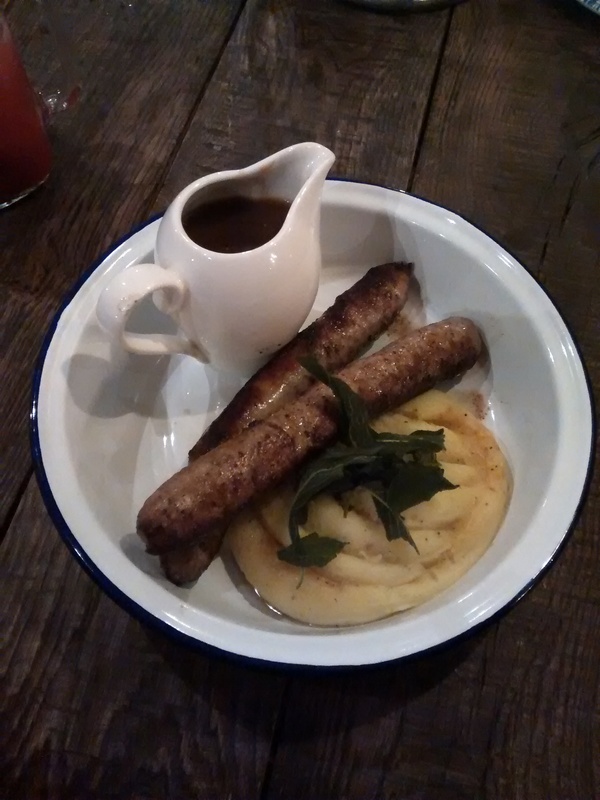 My first thought when I saw my sausage and mash dish was ‘Why have they served it on a camping plate?’ The enamel blue rimmed plate seemed a bit out of place, but I had seen dips arrive in mini wheelbarrows and patés in flower pots to neighbouring tables, so just rolled with it. The sausages and mash tasted good, and I liked having my own little jug of onion gravy to drizzle over everything. MrJ’s lamb kebab came proudly hanging on a vertical skewer with a bowl of french fries underneath. He said the meat was tender and cooked well, but I do admit that once he’d taken his meat off the skewer and onto his plate, the portion size didn’t look as impressive. However, he really enjoyed his dish. As we ate, there were lots of people coming and going for after work drinks and dinner dates, while a guitarist performed live music. It definitely had a chilled out vibe about it. We were too full for desserts, although there’s always next time as the strawberry and marshmallow kebab with dripping chocolate sounds too good to resist! Overall, we enjoyed it, and would probably go back. Our service was attentive and good throughout, however I think I’d only come back for food again if there was another deal or offer on, as although it wasn’t terribly expensive, it wasn’t anything particularly memorable (when you get past the presentation). 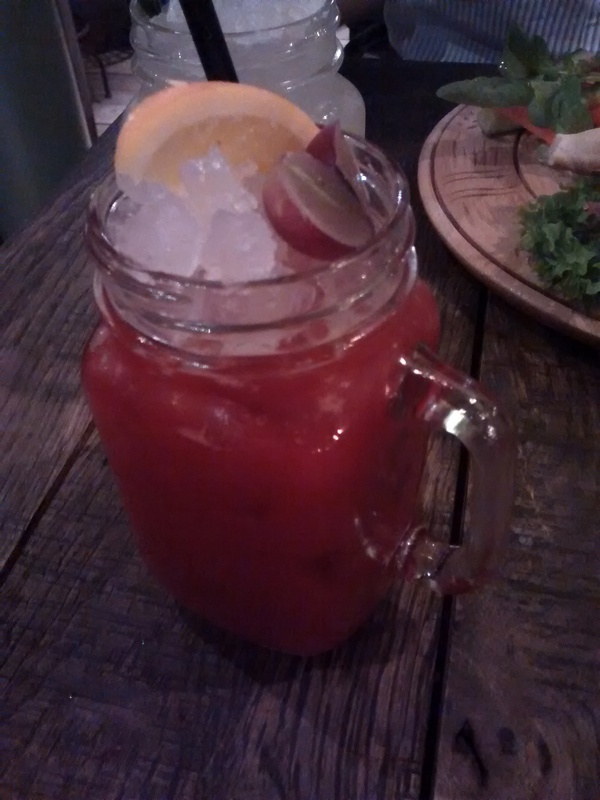 Have you been to The Botanist? What did you think? Let us know in the comments! The Botanist can be found at Monument Mall, Newcastle (side door to the left of Jamie’s Italian). Thanks for your lovely comment! Id definitely go back for drinks and nibbles! Glad you had such a lovely experience! I’ve been here a few times. Once in the soft opening week and a couple thereafter. So far just for drinks, I’ve not eaten there yet, although I’m hearing nice things and your review makes it more tempting. We’ve found the drinks prices to be, well, pricey, but It’s nice to have one more place in Newcastle where I can have fresh tarragon in my G&T – try it! Definitely looking forward to a few cold drinks on their beautiful terrace when the weather warms up, such a lovely space. The terrace does look absolutely lovely, and the view is great too! I do like that their drinks have fresh ingredients too. Thanks for your comment! Excellent write up. I am considering taking my wife for her birthday this year, though she has hinted at House of Tides instead. I’ve yet to visit House of Tides but really want to go! They’ve started doing a range of tasting menus that look really good!